There is no area of cooking more poorly understood or maligned than Barbecuing. If you're a reader who has only experienced the horrid charred remains of your neighbour's BBQ please I implore you to read on. Barbecue cookery is simply cooking any type of food outdoors. The reason it is so often done so poorly is because the "chef” I use the word loosely does not understand the importance of heat control. Firstly men who rarely if ever cook indoors do an awful lot of barbecuing. But for some reason because this form of cooking is done in the garden it seems to fall into his domain, perhaps harking back to our caveman roots? Basically there are two methods of barbecue cookery, direct cooking and indirect. This explanation refers to charcoal grills, later in the article I will go over the same principles using gas. Image a rectangular BBQ grill, fill one third of it with a high stack of charcoal, the middle third with a medium stack of charcoal and the final third leave empty. So you have created 3 heat zones…High…medium…and low (the empty third will get sufficient radiated heat. Now you have 3 heat zones you will have much more control and your confidence will grow so you can be more adventurous in what you cook (I have even baked cheesecake on the Barbie). If your barbecue is round then think of a pie chart and again divide your grill into thirds. To be able to cook using the indirect method your barbecue needs to have a lid. Again image a rectangular BBQ, this time placing equal (medium amounts) of charcoal at either end. In the middle place a disposable aluminium-roasting tray, ideally one that fills one-third of the space. This will be your drip tray to prevent flare up. Once your coals are tempered (which takes about 35 minutes) then you can place a joint of meat (say a shoulder of lamb or a whole chicken) and cook it without burning. You first need to rub some kind of oil and season the meat or you can marinate the meat before hand to add interesting flavours and textures. By closing the lid to your barbecue you are creating an oven and you will need to baste the meat from time to time ( the same as you would if you were roasting the meat in your oven. Cooked lovingly over coals will add a delicious slight smoky flavour to the meat. 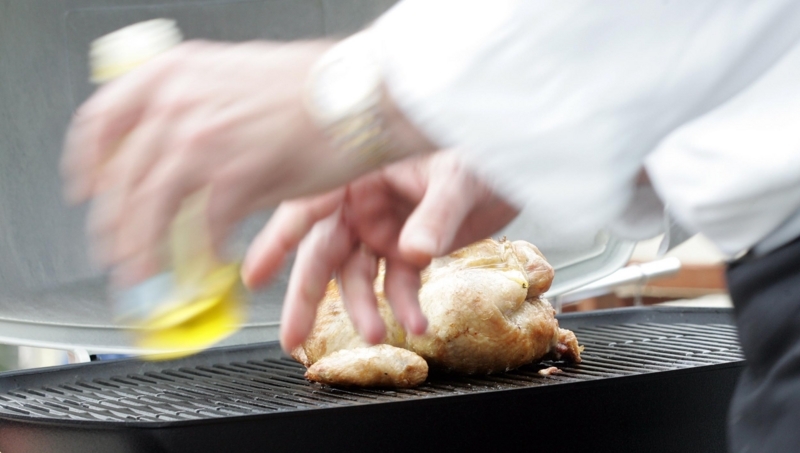 Both indirect and direct cooking methods can be done on a gas grill, using the same principles. For direct cooking on gas to ideally you need 3 gas jets to replicate 3 heat zones. Having 1 set on high, 1 set on medium and 1 set on very low or off. When using the indirect method on gas you of course leave the middle gas jet off, also make sure that the disposable drip tray prevents fat getting into the turned off gas jet. If you have more that 10 guests coming to your barbecue the chances are at least one or two of them will be vegetarians…so lets not forget them. To respect their wishes I usually cook all the vegetarian dishes first, then there can be no question that their veggies were cooked next to the meat etc. One of the most popular veggie dishes I cook is a Warm Grilled Mediterranean Vegetable Salad, comprised of courgettes, aubergines, red, yellow, green peppers, mild onions,*oven dried tomatoes, roasted garlic. I dress the salad with a good quality extra virgin olive oil and balsamic vinegar…. finishing the dish with roughly chopped fresh basil and torn pieces of mozzarella cheese. When cooked quickly on a clean grill the combination of fresh warm fruit, very cold homemade vanilla ice cream washed down with a glass of dry champagne takes some beating. There is a whole world of outdoor cookery that can intrigue and delight your senses once you have mastered the basics. Recreate those Mediterranean memories of azure blue waters, the fishermen landing their catch…sardines straight on the grill. Perhaps a shoulder of local spring lamb studded with rosemary and garlic as the sun begins to dip on the horizon. *To oven dried tomatoes cut your tomatoes in half, rub with olive oil, then season and cook on a very low heat of 100 C (gas mark 1) on the middle shelf with the fan on. This way the tomatoes not only cook but the fan helps to dehydrate them which concentrates the flavours.